Do you love chowing down on the occasional Big Mac, Double Quarter Pounder with Cheese, or maybe even a McDonald’s Apple Pie? If so, we have good news for you! McDonald’s has launched a new mobile app, and one of its best perks is helping you save on your next fast-food indulgence. You can even get some menu items for free, and everyone loves free food! Whether you’re a regular McDonald’s customer or just hit up the drive-thru occasionally with the kids, you’ll want to make it part of your McDonald’s routine to check out this new app for opportunities to save. How do you get the app? It’s easy: McDonald’s new app is available for free from the Apple store and the Google Play store. All you need to do is download the app onto your smartphone, set up your account, activate your location… and you’ll be good to go! You must be at least 13 years old to use the app and access the deals. Where and When Does the McDonald’s App Come Out? Once you download the app and enter your location, you might learn deals aren’t yet available in your area. But no worries — it’s coming soon! McDonald’s is rolling out the app across the country little by little. If you live in San Diego or New York City, you can already find great deals. The app was unveiled in those locations last week, so there’s no need to wait to get started. If you live anywhere else around the United States, you won’t have to wait long. The roll-out will continue over the next few weeks, so the app will be available nationwide by the end of September, according to McDonald’s website. While each region or store will have its own deals available, the company will also offer nationwide deals, so you’ll have plenty of ways to save. And they give you reason to check back regularly, because new deals will be released every week. Once you have the app downloaded, your account set up, and your location indicated, you’ll be ready to get some great deals, including free menu items. Be sure to add your location, because the app is customized to provide local and national deals to each customer. You wouldn’t want to miss out on local deals while hearing about the ones available 1,000 miles away! Once you’ve located a deal you’re interested in, all you have to do is select the offer you’d like to use, click “redeem” on the app, and scan your phone when you place your order. The app also includes a few other perks. In addition to helping you find McDonald’s stores near you, it shows the amenities of each restaurant, including which ones have a Play Place for the kiddos to burn off some energy, where you can grab your meal via a drive-thru, and which locations have free Wifi if you need to get some work done. Trying to shed a few pounds? You can even glean nutrition information from the app that will help you make healthier purchases. 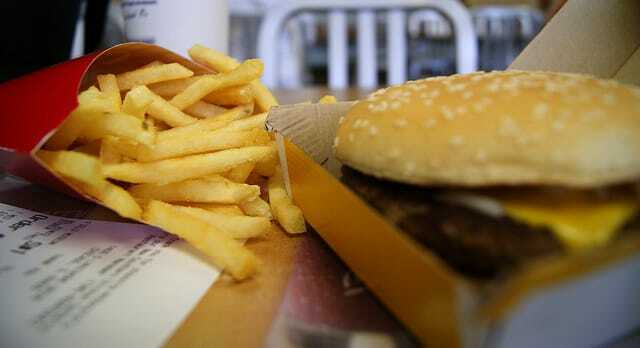 For example, it will tell you that a Double Quarter Pounder with Cheese has 780 calories and 45 grams of fat (whoa! ), but a Grilled Ranch Snack Wrap only has 290 calories and 13 grams of fat. Which one would you go for? Knowing the nutrition information for each menu item can go a long way toward helping you figure out the healthiest way to indulge in your craving for fast food. Now that you know where to get the app and how to use it, let’s dive into the good stuff. What free food can you get your hands on with this new app? First up is a free sandwich from the regular or breakfast menu, available to the first 8 million people who download the app. McDonald’s allows only one free sandwich per person, so don’t bother re-downloading the app multiple times to get extras. You also can’t transfer the deal to anyone else, so be sure to show up in person to get your free item. We’re just starting to get a sense for local deals, since the app has only rolled out in a few cities. In San Diego, you can buy one Big Mac and get the second one free. Other Southern California deals so far have included free sandwiches, “buy one get one free” breakfast sandwiches, $1 off premium burgers, saving $4 on orders over $20, and a free Happy Meal with the purchase of select salads. While some deals require purchases, such as getting a free dessert along with another purchase, others simply offer free items you can enjoy. Who would pass that up? Other promotions will include free breakfast sandwiches, desserts, Happy Meals and other menu items, according to Business Insider. If you’re a frequent coffee drinker, you’ll be excited to hear about deals to help you get your caffeine fix. Since McDonald’s new app includes a loyalty program, every sixth McCafe beverage will be free. All you have to do is use the loyalty program app when ordering your McCafes drinks. Remember, these deals vary around the country, so your best bet is to add your location to the app to find out what great deals you can get locally. And check back frequently since the deals are scheduled to change weekly! Your Turn: Have you tried the new McDonald’s app? What deals did you discover?